Home > Resources > Transfer > How to Transfer Contacts to iPhone X/8/7? New phones are always catching people's attention. iPhone X and iPhone 8 are announced recently and I guess most Apple fans are planning to switch from their old phones to the new iPhone X or iPhone 8. Upgrading to a new iPhone is an exciting thing, but transferring contacts from your old phone to the new iPhone is a tiresome businiess. Android users can transfer contacts from old one to the new one easily by inserting the SIM card to the new device, but iPhone doesn't allow users to transfer contacts like that. Still searching for other methods to copy contacts to your new iPhone X or iPhone 8? We write this post with the easiest and most direct way to transfer contacts to iPhone X/8/7/7 Plus/6S/6 with the help of iPhone Contacts Transfer. 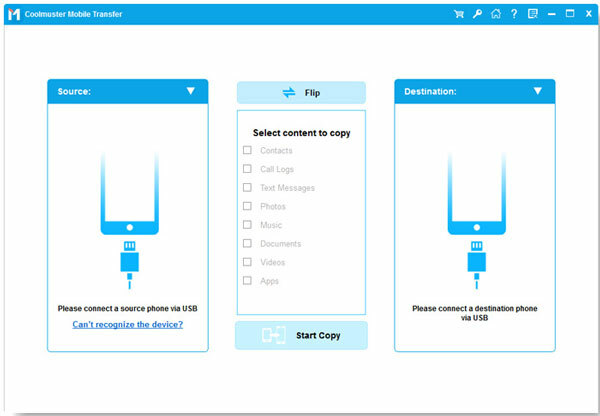 It enables you to transfer contacts from your old Android phone or old iPhone to the new iPhone X, iPhone 8 or iPhone 7 with just one click. Apart from contacts, it also allows you to transfer messages, photos, videos, call logs and more to new iPhone X, iPhone 8, iPhone 8 Plus, or iPhone 7. Now, you can read the following guide to learn how to use the iPhone Contacts Transfer to transfer contacts to iPhone X/8. Download and install the iPhone Contacts Transfer and click "Phone to Phone Transfer" section from the primary interface. Then, connect your old phone and new iPhone X/8/7 to the computer via two USB cables simultaneously. 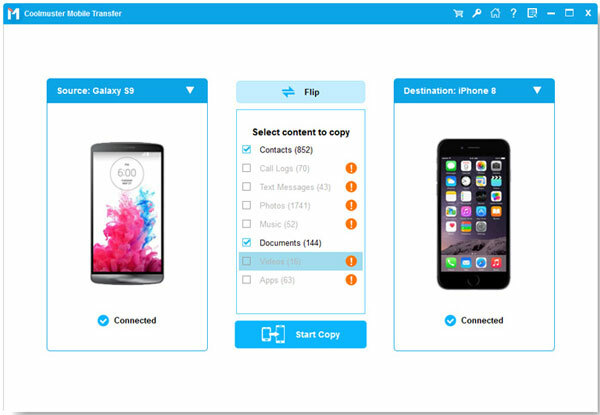 The two connected phones will be detected by the software and displayed on the interface. Make sure the new iPhone is on the right, otherwise, you should click Flip to switch them. In the middle of them, select the "Contacts" tab if you only want to transfer contacts between the two phones and directly give a click on the "Start Transfer". After that, all contacts will be transferred from the old phone to the new iPhone X or iPhone 8.